Stratigraphy on the Moon is key to understanding its geological history. In northern Arizona, a spectacular region of exposed, layered rocks over 6,000 feet thick was carved by the Colorado River. Aptly called the Grand Canyon, it represents over a billion years of Earth’s history. Geologists are able to study the history of past ages in exquisite detail by reading the historical record found in that well-known natural landform. No matter the planet, geologists are always searching for layered rocks. The study of rock layers (stratigraphy, from strata, meaning rock layers) allows scientists to reconstruct the geological history of a region and over time, an entire planet. The nature of the Moon does not lend itself well to the display of rock layers, yet considerable effort has been expended searching for outcrops. Most layered rocks on the Earth are created from water-laid or wind-blown sediments, and neither of those processes occurs on the Moon. Still, the lunar surface has been built up piecemeal by the sequential deposition of blankets of ejecta—the ground-up rock thrown out radially from the center of impact craters and basins during formation. The overlap relationship of these ejecta deposits allows scientists to reconstruct the history of the Moon, i.e., younger impact craters overlie older ones. This simple methodology has allowed us to decipher the stratigraphy of the Moon. Given that geologic history, one might expect that some evidence of rock layering was found in the abundant data returned from the Moon, but such evidence is limited and ambiguous. One of the most startling finds during the Apollo missions was a breathtaking view of Mt. Hadley, a lunar mountain north of the Apollo 15 landing site. Astronauts Dave Scott and Jim Irwin were startled to see evenly spaced, sub-horizontal lines in the mountain, similar in appearance to fine-scale layering present in some terrestrial strata. It looked as though the mountain was a single, gigantic crustal block, uplifted and overturned by the impact that created the nearby Imbrium basin. The layering described by the astronauts greatly intrigued the mission scientists, who were unable to clearly see it in real time in the TV pictures sent to Earth. When the crew returned to Earth, images taken on the surface dramatically showed this layering (above, left). But this presented scientists with a puzzle. Because large impacts are highly energetic, chaotic events, how could they generate evenly spaced, regular layering? Some team members began to suspect that something else was going on. Ed Wolfe and Red Bailey of the U.S. Geological Survey made scale models of the mountain and dusted it with cement powder. They then photographed it under low, oblique illumination, similar to the lighting conditions of the landing site during the mission. 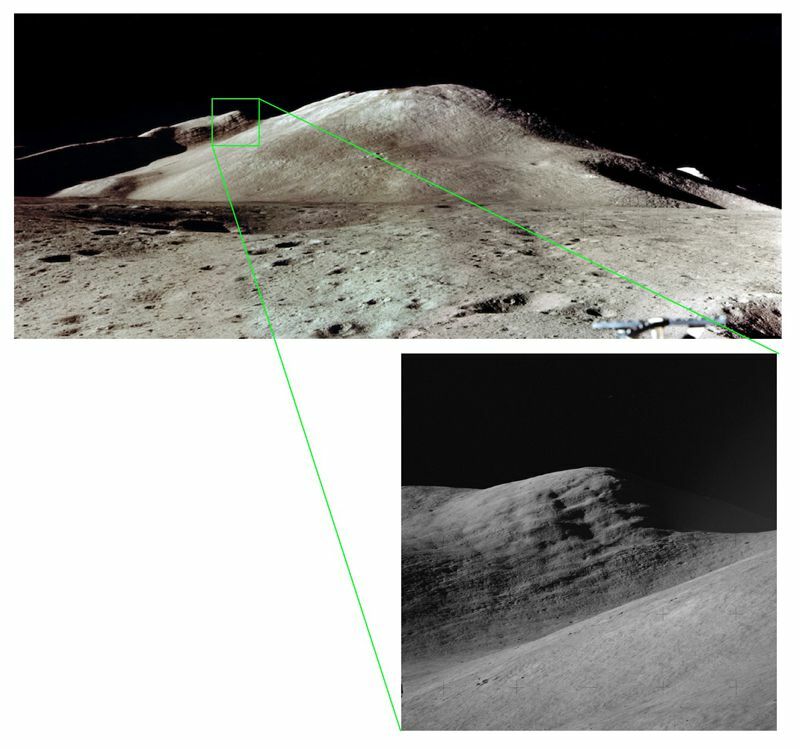 Surprisingly, fine-scale linear features were evident in the laboratory “mountain” (above, right), suggesting that the “layering” seen by the astronauts on the Moon may have been an illusion, caused by the low-angle illumination of a particulate, granular surface. Other layered deposits at the Apollo 15 site were less amenable to explanation as an artifact of lighting. A ridge southeast of the landing site named Silver Spur displayed a set of topographic “benches” associated with its apparent layering (below). On Earth, the formation of a bench indicates differential erosion, with hard rocks making up the cliff-forming units and softer rocks being expressed as more gently sloping units. However, such an erosive pattern on the airless, waterless Moon is difficult to envision. To this day, we do not have a good explanation for the origin of Silver Spur. As an example of layering in the highlands, it remains problematical. 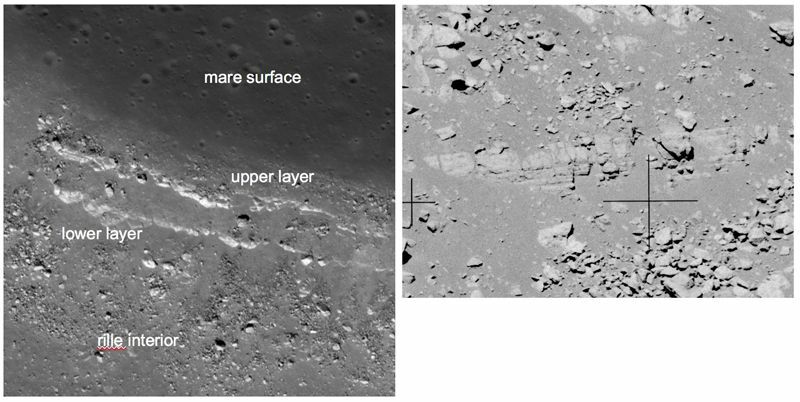 Clear and unequivocal layering was observed in the walls of Hadley Rille, a lava channel located near the landing site. In this case, it is easier to accept that we are looking at real layering—the rille cuts into a series of lava flows that cover the landing site (below). Lava flows make up layered deposits on Earth and there is no reason to assume that they wouldn’t do likewise on the Moon. In fact, the layering observed in the walls of Hadley Rille could be significant for another reason, one that may hold great scientific promise for future explorers. After a lava flow is extruded on the Moon, it remains exposed to space. There, over millions of years, the impact bombardment of micrometeorites grinds the once solid lava into a powdery soil called regolith. Because the Moon has no atmosphere, this exposed soil layer contains a record of information about the Sun (gases called the solar wind implant atoms of hydrogen and other light elements in the dust grains) and the galaxy (from high-energy cosmic rays). When a layer is formed and then exposed to space for hundreds of millions of years and subsequently buried (like a time capsule) by another, younger lava flow, that earlier ancient regolith would contain information about the Sun and galaxy not as it is now, but as it was billions of years ago. The idea of an ancient, buried regolith (called a “paleo-regolith”) captured scientists’ imaginations—such a deposit would hold information from an interval of known position and duration in the past (determined by isotopically dating the lavas above and below the ancient regolith). It appears that such an ancient, buried regolith exists in the walls of Hadley Rille. The lowest layers consist of ancient, relatively aluminous lavas called KREEP basalts. From the dating of Apollo 15 samples, we know that these rocks formed 3.84 billion years ago. Over this layered unit is a covered interval about 10-20 meters thick (a friable, slope-forming unit, like regolith). Above this slope-former are two massive rock layers, a thick massive unit and a thin, finely layered unit. These upper two units probably consist of mare basalt lavas of the two types found at the Apollo 15 site, both of which date to around 3.3 billion years. Thus, the regolith lying between these lava flows may hold the record of more than 500 million years of solar and galactic history, an interval from the distant early portion of Solar System evolution. In addition to the history of the Sun, this paleo-regolith would also contain fragments of impact-melted rocks and glasses from a distinct, bounded interval of lunar history. Such a sample would allow us to assess whether the impact flux on the Moon in this time period was comparable to or different from the current rate. Such information is relevant to understanding the impact history of the Earth, a factor that we know from lunar science to strongly influence the rate of evolutionary change. Astronauts descending into the rille could sample all of these units in turn, allowing scientists to reconstruct this ancient history in detail. In this sense, Hadley Rille would be analogous to Earth’s Grand Canyon—a slice into the deep time history of the Moon. New high-resolution images of the Moon from NASA’s Lunar Reconnaissance Orbiter show that layered deposits, such as those seen in Hadley Rille, are common in the walls of rilles and impact craters occurring in the maria, where layered lava flows are expected. Finding layering in the highlands is more problematic, although some large ejecta blocks appear to consist of layered rocks, quarried out of the crust during impact. We seek such rock layering on the Moon for the same reasons that geologists look for them on the Earth—as time capsules to be carefully opened and read, giving us new insights into the complex history of the Moon.